Summer in Montana is revered, yet brief; already, days are beginning to shorten. With stone lamps, Bozemanites can enjoy the outdoors no matter what the season, by bringing a piece of the outside in. These unique lamps look pretty during the day, shine brilliantly at night and provide a warm reminder of the natural beauty we call home. 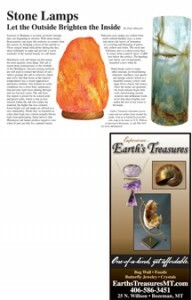 Himalayan rock salt lamps are becoming the most popular stone lamp. The salt is mined deep underground, in the foothills of the Himalayas. Ancient mining methods are still used to extract the blocks of salt. Above ground, the salt is sorted by clarity and color. Salt that forms at the highest temperatures has a clearer appearance and better stability. Salt formed in cooler conditions has a more flaky appearance that prevents light from shining through and can fracture easily. The salt from this region is prized for its natural pink and peach color, which is due to iron infused within the salt (the redder the material, the higher the iron content). Some bright red salt lamps are offered as a rare commodity. While they’re beautiful in color, their high iron content actually blocks light from penetrating. Some believe that Himalayan salt lamps produce negative ions when lit and can thus be a natural ionizer. Pakistani onyx lamps are crafted from multi-colored banded onyx, a stone that shows the layers of formation in a swirling and blending of green, red, yellow and white. The most rare Pakistani onyx is a deep ocean blue. It comes from a narrow layer 12,000 feet below the surface. The banding and clarity cast exceptionally beautiful colors when lit. Stone lamps come in many other unusual, yet breathtaking minerals: amethyst, rose quartz and sponge calcite (which is a beautiful creamy yellow with large Swiss cheese-like holes). Once the stones are quarried, the local artisans begin their craft, transforming ancient minerals into utilitarian works of art that shine brightly and soften the feel of any room in the home. Earth’s Treasures welcomes you to come and see rarities from around the globe. Visit us at EarthsTreasuresMT. com, stop in the store at 25 N. Willson in downtown Bozeman, or call 406-586-3451 for more information.